Dr. Rothstein has assembled top experts to present the current status of the role of endoscopy in managing the obese patient. 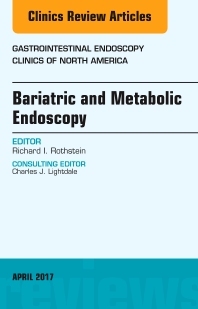 Authors present current clinical information on the following topics: Small Bowel Target Devices and Techniques; Reimbursement Issues for Endoscopic Devices Used for Metabolic Endoscopy; the Physiologic Alteractions of Bariatric Surgery; Non-Balloon Gastric and Pyloric Therapies for Obesity; Aspiration Therapy for Obesity; Endoscopic Therapies after Surgery; Duodenal Mucosal Resurfacing: Role for Diabetes Treatment; Gastric Plication; and Gastric Balloons. Readers should come away with the information they need to utilize endoscopic techniques to improve outcomes in their patients.